Just looking at the picture of this vegetable fried millet I’m drooling all over the place and thinking of making it again. Yes, millet, I hear you! How can you say no to that? Seriously, even though I felt sick this whole afternoon, it’s like this delicious quick dinner can cure all my illnesses and bad moods in a second. Dinner is planned. This recipe is very easy, super tasty and made in around 20 minutes. It’s naturally gluten-free, vegetarian and simply perfect for weeknights! Okay so here’s what we’ll be doing. First we’ll cook some millet. I would recommend to follow the instructions on the package. Still, if you’re very rebellious and don’t like to follow instructions (I often do that with instructions on labels) I recommend you bring millet to a boil and then reduce the heat, turning off after 5-7 minutes, while still keeping the cooking pot on the stove with closed lid for around 5-10 min. That’s just fiy if you decide you do need some help with cooking millet. Also make sure to not use too much water, usually I cook millet in proportion 2:3 (millet:water, although, might be a little more water than that). and lots of vegetables. Now I know you have lots of leftover vegetables. “I don’t have any vegetable leftovers, I eat all my veggies as soon as I see them”. AAaaaaeeerrr. Lies!!!. We all have leftover vegetables. Right now there are some carrots in my fridge that need some serious CPR. They’re one step away from becoming mold. What do we do with such vegetables? We don’t throw them away or feed them to our enemies, we use them in this beautiful and nutritious vegetable fried millet. That’s what this dish was made for. I make it every single week – it’s the most delicious way you can eat any leftover vegetables. Did I mention leftover vegetables? Leftover vegetables. So okay you’ve cooked your millet and it looks fluffy, not mushy. You’ve found some old vegetables and decided to chop them for this. with a lid to cover. Put it on a stove, crack some eggs and scramble them in there. I used olive oil for this – coconut oil will work as well. Then add onions, garlic, cabbage if you have any and then millet. After that you stir like crazy and in the end add your leftovers. When you’re done you start eating and thanking mother nature for your taste buds. I’ve already talked a little about my admiration for millet in this recipe post. 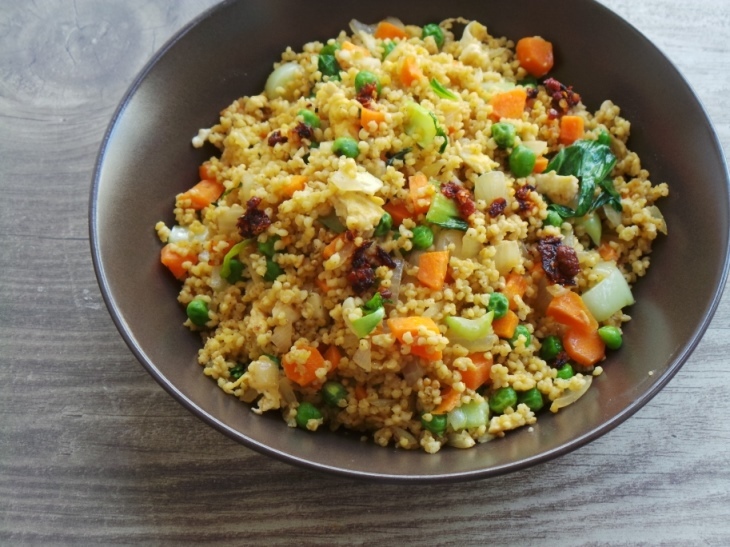 Maybe it’s also worth to mention that this recipe is high-protein, high-fiber and loaded with antioxidants, thanks to all the vegetables you can use. Even though they’re leftovers, they still have some talents to share. I’ve said it many times, but I’ll repeat: all of these things (antioxidants, fiber, healthy fats, iron) are important for healthy, young, firm and radiant skin. You won’t find them in your regular fried rice. If you don’t have cooked millet, cook millet according to package instructions. The millet should be fluffy, not mushy. 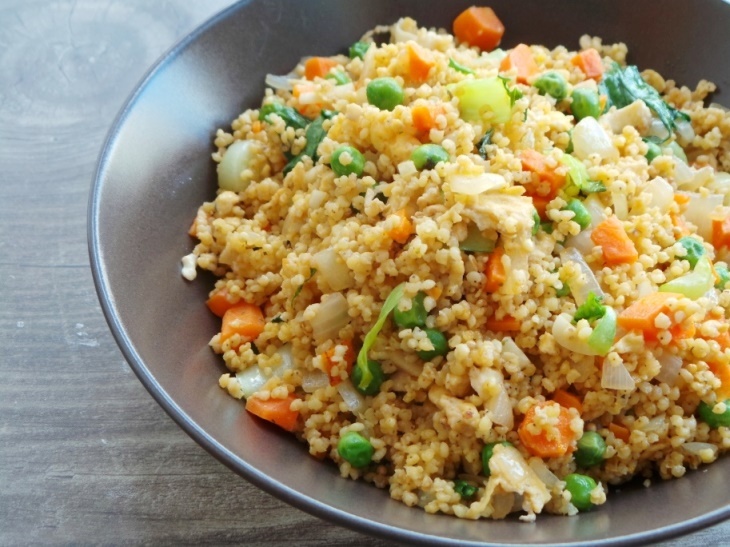 While cooking the millet/ before starting chop all vegetables – start in this order: onion, garlic, if you have – broccoli or cabbage, carrot, bok choy, pepper - because you’ll be putting these vegetables in this order, you need to have them ready. Once millet is cooked you can start with the fun part: In a large non-stick skillet with a lid, scramble the eggs at medium-high heat with some olive oil. When eggs are ready, add onion and garlic and stir well together. Add peas and millet, stir again. Add 1 tbps olive oil and 2 tbsp soy sauce. Also if you have cabbage – now’s the time to toss it. Stir well and taste. Do you need salt? If the answer is yes, add 1 more Tbsp. soy sauce in the next step. Add broccoli, carrot, bock choy and stir everything well, turn off heat and stir for a few more minutes. Then you’re ready! Taste and add salt or pepper if you need. Serve with some Asian chilli sauce, if you’d want something spicier. Hope you like this recipe, let me know if you make it and use your leftovers! This was delicious! I doubled it for our family of 6 and it was so tasty. Wouldn’t change a thing! Thank you :), I’m happy you and your family enjoyed it! My kiddo likes his carrots cooked so I steamed my chopped carrots a bit before adding. So good!!! Also I added the garlic and onion to the egg and scrambled it with it, so they could cook a tad longer. Put salt and pepper in while scrambling, and a tiny bit (1TB) of nutritional yeast seasoning. And used Bragg liquid aminos in place of soy sauce — so so so delicious!! My leftover veggies were: celery and carrots. That’s it! 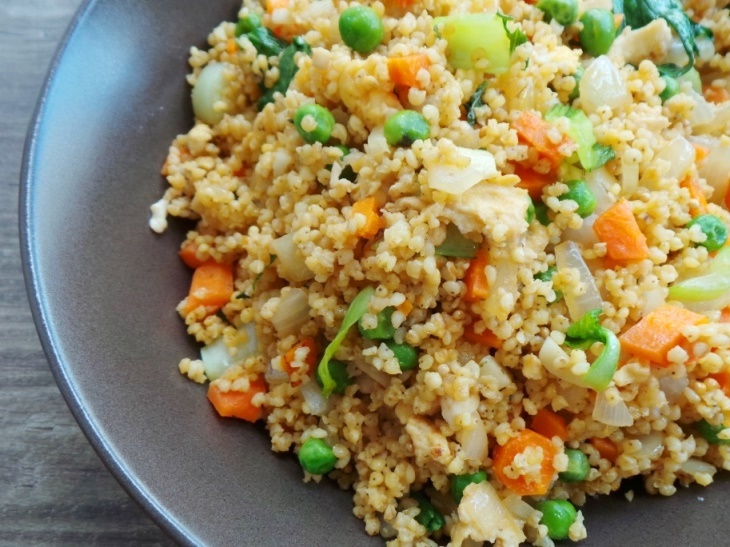 With the peas, onion, and garlic, this millet dish is AMAZING. THANK YOU! So happy you enjoyed the recipe – love your suggestions! 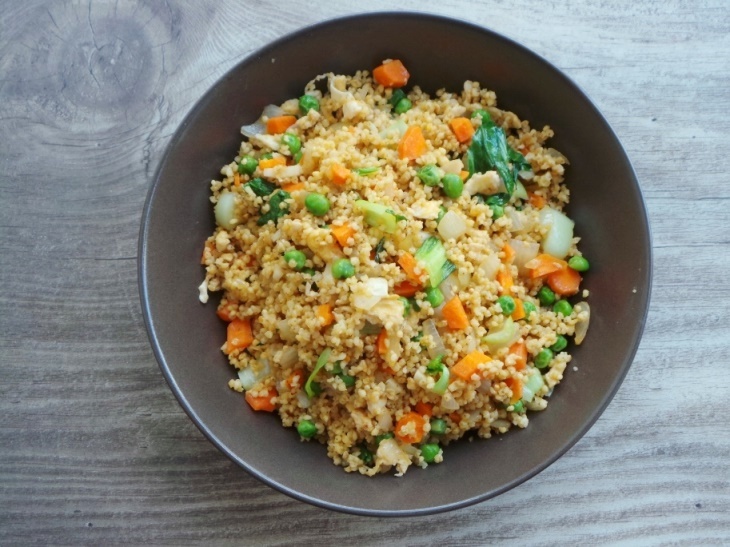 Made it last night for dinner….it was really good…I used organic coconut aminos from trader Joe’s in place of soy sauce.I made it for 2 dinners so today we will have a repeat…can’t wait.I used carrots,onions and peas…..nothing needs to be changed in this recipe….THANK YOU. Thank you Theresa, glad you enjoyed the recipe!